When it comes to your swimming pool, the ideal scenario is to enjoy a refreshing dip—without worrying about the havoc that chlorine might inflict on your skin, hair, lungs, and eyes. Your swimming environment shouldn’t be an anchor around your neck. To ensure smooth sailing, all it takes is having the right technology on your backyard resort. Homeowners who opt for an ozone system on their pool to help sanitize the water find they have a superb swimming environment without the troubles that plague so many traditionally chlorinated pools. Tens of thousands of pool owners across the U.S. rely on ozone generators to effectively maintain pool water in conjunction with only a minimal amount of chlorine. This proven technology helps makes the aquatic experience a real pleasure for swimmers, delivering sparking, “polished” water that looks inviting and that feels good on the skin—remarkably soft to the touch. Ozone-treated water is good to your body in other ways too: It sanitizes water and prevents the harsh chemical byproducts that often open the doors to a host of unhealthy side effects. Also called “triatomic oxygen,” ozone (O3) occurs naturally in the environment—and yes, a layer of it surrounds the earth as a protective barrier. This powerful compound forms when a regular, two-atom molecule of oxygen (O2) combines with a free atom of oxygen. Thus, ozone is a special form oxygen composed of three atoms, vs. the usual two. Ozone forms all the time with the sun’s ultraviolet radiation, as well as from lightening. Both split apart oxygen molecules, freeing their atoms. Then, these individual atoms of oxygen join up with two-atom oxygen molecules and now you have a freshly minted molecule of ozone. A good example of this natural process is a rainstorm with lightening: Ozone is the sweet, fresh smell you often notice when the rain clears, and it’s what makes the outdoor air have that kind of bright, shiny appearance when the sun comes out. The form of triple-charged oxygen can also be man-made. Effective technology to produce the handy substance has been around for decades. The value of ozone is that it can be used as a safe, powerful sanitizer—achieving much of what traditional sanitizers like chlorine and bromine do, but without the nasty side effects. With an ozone system performing the primary sanitizing work in your pool, you will be able to cut way back on the level of chlorine needed. The technology—available from many pool builders—will inject ozone into the pool water as it passes through the equipment for filtration. Once it does its job of helping destroy contaminants in the water, ozone quickly dissipates. That makes this process both reliable and friendly for people—as our furry friends who also enjoy occasional dips in the pool. 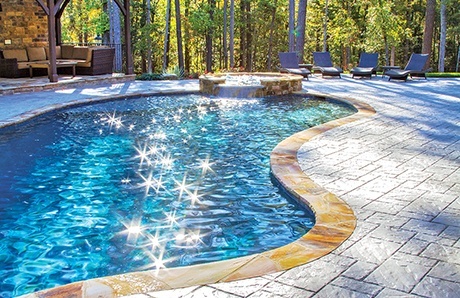 And when you choose a quality ozone system that’s correctly installed on your pool with other equipment like UV germicidal light, you can expect some serious benefits: Your water will require up to 80 percent less chlorine, 90 percent fewer clarifiers, 90 percent fewer shock treatment, and 95 percent less algaecide. So, if you were planning on old-school tablet, liquid, or powder chlorine for your new or existing pool, you may want to reconsider. There is a better way to clear, swim-ready water. Let’s take a look at some important functions that ozone provides as a primary pool sanitizer and why it’s a smart choice for your backyard resort. Oxidation is the process of neutralizing contaminants on a surface, substance, or material. With swimming pools of course, that’s the water. Like chlorine, ozone is a powerful oxidizer. However, it works up to 3,000 times faster than the chemical, and in pools, it does so in a much safer manner. By letting go of that extra third atom of oxygen, ozone combines with invaders like algae, bacteria, viruses, and body oils in the water. When it merges with the unwanted guests, ozone renders them harmless. In addition, ozone outperforms chlorine when it comes to tackling a dangerous pathogen that chlorine really cannot handle: Cryptosporidium—better-known as “Crypto.” Even the federal Environmental Protection Agency indicates that ozone does the job at destroying this dangerous parasite. Along with ozone’s proven ability to combat disease-causing pathogens in pool water, it delivers a track record for doing so safely. While chlorine gets added directly to the water that circulates inside the pool, the entire ozonation process takes place only as water passes through the pool equipment. After ozone does its good work sanitizing water, the treated water returns to the pool with no toxic byproducts left behind from the disinfection process. In fact, ozone is so safe and effective, it’s even used by municipal water agencies to help purify tap water in cities like Dallas, Milwaukee, Los Angeles, and Las Vegas. Nearly all bottled water companies use it as part of their arsenal to destroy dangerous microorganisms in their products so they’re ready for human consumption. 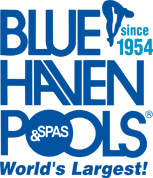 When it comes to pools, the pH reflects the proportion of acid and alkalinity in the water. For a healthy swimming environment, the sweet spot for pH is a range of 7.3 to 7.7 ppm (parts per million). Unlike chlorine (or a bad marriage), ozone has a fantastic relationship—with pH. Instead of throwing it off balance the way chlorine and its byproducts can, ozone is pH neutral with zero impact on the level. That means if your pool is equipped with a quality ozonation system, it will require less pH adjustment and water treatment—thereby saving you time and money on maintenance and chemicals. Better yet, a pool with happy, balanced water has a good relationship with its swimmers—leaving fewer opportunities for aggravating eye, skin, and lung irritation and even more serious health condition. Nobody likes that strong bleachy odor that comes from a poorly chlorinated pool. What actually causes that awful smell is the formation of byproducts of chlorine called chloramines. These chlorine spinoffs form from chlorine’s disinfection process; when the chemical combines with contamints like sweat, urine, saliva, you have chloramines rearing their ugly heads. Now, with an ozonation system cutting the needed amount of chlorine in your pool, there will be very few of these nasty compounds around—fewer to create fumes that smell bad—or, worse yet, that irritate swimmers’ eyes and respiratory systems. That’s because ozone destroys the vast majority of contaminants that are behind their production in the first place. Most anyone who has gone into a pool at one time or another has dealt with a variety of bodily hazards, such as burning eyes and skin dryness. Some people even develop a chlorine rash, which may involve highly itchy skin, rashes, or boils. Another undesirable phenomenon is chlorine dermatitis, which is like a chemical burn. Additionally, those with chronic skin conditions like psoriasis may experience flair ups or new fissures as the chlorinated pool water strips away protective, natural body oils from their skin. While these conditions can be aggravating, other, more significant effects can arise from the traditional chlorination process and its chloramine byproducts. For example, children, the elderly, and those with respiratory conditions may experience coughing, wheezing, asthma attacks, or related problems. Even worse: Formal research has found that children who spend a great deal of time in chlorinated pools may have increased lung sensitivity and higher odds of developing respiratory conditions such as asthma and allergies. Do you have any concerns about avoiding possible carcinogenic substances in your daily life? Your family may be absorbing more of that that chemical soup than you realize: It’s not unusual for swimmers young and old alike to accidentally swallow pool water while playing and swimming. While there is no conclusive research on the matter, some wonder about undetected damage that can result from long-term ingestion of chlorinated water, especially for developing children. If you would like to limit overall exposure to chlorine and other caustic pool chemicals, you have ways to do so. Toward that goal, wouldn’t it be best to slash the chlorine and chemicals needed to feed your pool? As a chlorine alternative, ozone will help ensure a healthier aquatic environment with few or none of these of these potential impacts on you and your family’s health. For a final thought on ozone systems, consider a worldview from Germany—a standard bearer for drinking- and pool-water quality. There, ozone systems are the sanitizer of choice. Germans are so accustomed to pristine swimming environments without chlorine that a group of European swimmers at the 1996 Atlanta Olympics refused to compete in a chlorinated pool! What caused a group of highly disciplined athletes to stage a protest and possibly forego Olympic medals? They were acutely aware of the potential consequences of chlorine-only pools—the toxic byproducts that can pose health hazards. Only after officials added ozone to the pool did the swimming events commence. Four years later, at the Olympics in Sydney, officials made sure to use ozone in the pool. In fact, that Sydney pool earned high praise for its water clarity, with world-class swimmers noting the pool was one of the “fastest” in the world. One reason may have been that swimmers did not have to contend with red eyes, skin irritation, or the chemical odors that often accompany traditionally chlorinated water. If it’s good enough for Olympic athletes, it’s probably the right call for your home pool, too!